The barriers to cross-platform multiplayer are slowly being eroded away, with even the previously stubborn Sony finally acquiescing. It’s increasingly prevalent between Xbox One and PC, especially, with both platforms already sharing Xbox Live. Microsoft games like Sea of Thieves, Forza Horizon 4 and Gears of War 4 all feature cross-platform multiplayer. In many cases, using the loathed Microsoft store is still necessary, but a Steam beta update suggests that might cease to be the case. Spotted on GitHub and reposted on ResetEra, the code references Xbox network features and hints at possible closer links between Steam and Xbox Live. 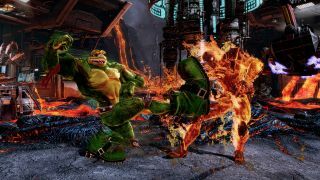 It’s worth noting, however, that there’s already cross-platform support between the two platforms for games like Killer Instinct. These Windows 10 games feature on both the Microsoft Store and Steam, while more recent ones, like Sea of Thieves, are Microsoft Store exclusives. The cross-platform multiplayer that already exists between Steam and Xbox isn’t extensive, however, and you might not even have been aware that it existed. The update suggests that Valve could be looking to expand this, though it’s not made any announcements yet. I’ve reached out to Valve for more details.